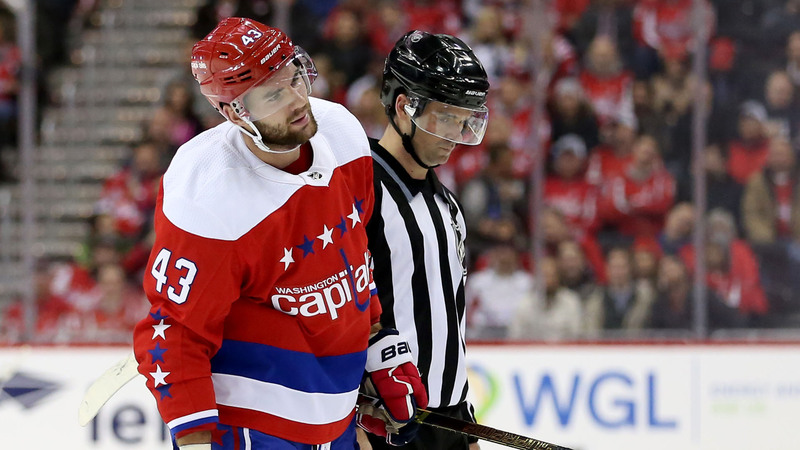 Capitals winger Tom Wilson is in the news for a controversial hit again. Wilson was handed a match penalty and ejected after he dealt Devils winger Brett Seney an illegal check to the head in the two team’s matchup Friday. With the match penalty, Wilson is dealt an automatic suspension pending review by the NHL’s department of player safety. Seney left the game after the hit, but returned in the third period. Capitals coach Todd Reirden expressed frustration with the call after the game saying Wilson wasn’t even trying to make a hit. “This guy’s doing everything he can to try to play the right way and this is how things are happening and it’s a tough situation,” he said, via NBC Sports Capitals. The 24-year-old winger has been penalized multiple times for questionable hits on opponents. He has been suspended four times in his last 105 games and was dealt a 20-game penalty to start the season. The suspension was later reduced to 14 games by an independent arbitrator. He has played nine games since coming back. Wilson signed a six-year, $31 million contract with the Capitals before the season.